It's been way too long since my last video, more than I would have liked, but today I'm back with a fall look. Still keeping up with the oversized theme that we started Sunday. As always you can enjoy this one in both video format and pictures. Please do subscribe to my YouTube channel for more videos and tell me what you think about this one. Gorgeous outfit! I love your scarf and I really like how you've styled your choker as a bracelet! Nice layering, I love the grey tones and the slip-ons most of all. I love the different grey shades in this look. I love the video! Your scarf is so cute. Such a great fall look. Perfect for Thanksgiving!! What for a beautiful scarf and outfit! I liked the video, the park, the leaves on the floor, very autumnny! You look lovely, as always! Hope you are having a nice week! The scarf is gorgeous. I love it. And the grey choice of colour is welcoming.. Good work girl. I just love outfits like this, big scarves are just so warm and cozy! Obsessed with your fall! You look so cozy and chic! Love your outfit, the coat and the scarf are fab! 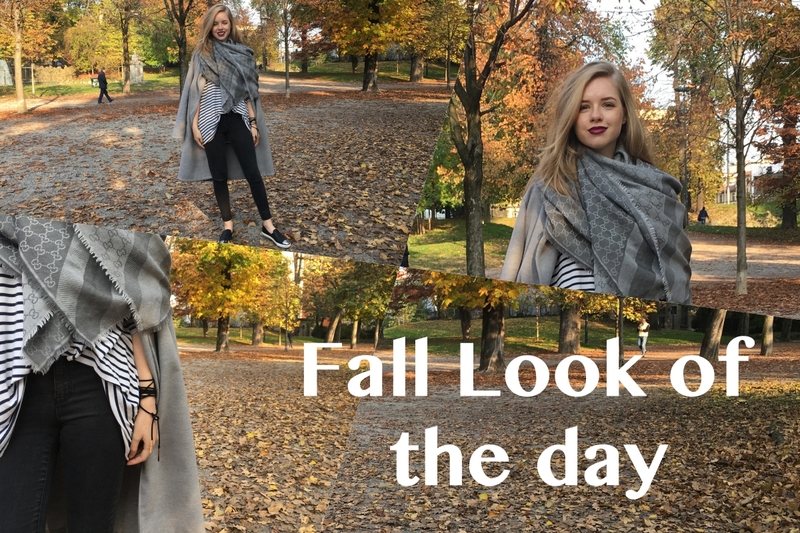 Carina, thanks for sharing this beautiful fall outfit; it looks so pretty and comfortable to wear! I am also in love with your lipstick shade here - do you mind sharing what is it? Have an amazing day! That scarf is so beautiful, really love it. Such a beautiful outfit and it's so perfect for fall! Love the way you layered it! Love the mix of black and grey and white! So chic! Looking gorgeous girl. Love this look! Lovely photos! I love the comfort and the chic pieces. Well styled! This is gorgeous! I love the cape! I’m so in love with all the layering going on in this outfit! It looks so effortless, like a model off duty look. Thanks for the inspo! So unique, I love the look! You really can't go wrong with a blanket scarf, especially if it's Gucci! And those Miu Miu slip-ons add the perfect touch!